Liz and I want to wish you and yours a Happy Mother's Day! I'd like to know whether making the film affected Darlene emotionally in any way, as in, did it make her look at her own life, or the lives of those around her, and re-assess things? Did it give her a better understanding of her own life, and the lives of those less fortunate than most, whether simply through lack of money, difficult family life, mental illness, or whatever the case may be? She was wonderful playing Gilbert's poor mother, I find it very touching and it certainly makes me cry at the end - would she agree with me that the story makes one sit back and think, and realise what the important things in life really are? I would agree with you that love and family are all that really matter. If you have those you can withstand anything else that comes along in life. I didn't have to reflect too much on the life of Bonnie, since she and I had so much in common. I have never been poor, but I have been in situations where money was very tight and we ate lots of beans & cornbread, and bologna sandwiches. My own brother is mentally challenged, and I had often thought about being a burden to my children. I surely felt the shame and humiliation that society assured me I should feel for looking the way I did. I hadn't had much experience with mental illness at that time, (though there are those that would swear I had. lol), but I felt I could really relate to Bonnie's life for the most part. I didn't start out fat, just like Bonnie, but things along life's way had had a power over me that I wasn't able to deal with in a normal way, so I ate. Never dreamed I would be so large.......I can assure you, neither did Bonnie. I was happy to been able to show folks that big people have heart, feelings, dignity. It was a huge validation for me. I did sit back and think.....mostly about how far God was willing to go to show me I had worth. That was the most amazing part of the whole experence! Beautiful!!! HAPPY MOTHER'S DAY, DARLENE AND ALL!!! Well It seems that viewers and actors alike were made to think about life and I think that was what Peter Hegdes had in mind with WEGG. When I think of it. Its a good film to watch on Mothers Day. 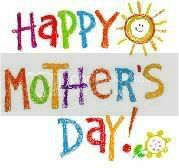 Happy Mothers day to Darlene, and all of our zoners who celebrate Mothers Day today. Darlene, thank you so much for replying - I feel quite humbled by you, really. I watched an interview with you recently, and you just seem such a beautiful person. I'd therefore like to give you this virtual *BIG HUG*! Not much I know, but meant with all my heart. Please take care, and know that I, and all Zoners, think you are one amazing lady. Darlene, your words struck a chord with me, especially with your comment about not dreaming about how you would be. It is something I have thought often about myself. I think it is wonderful that you have been an inspiration to others but also terrible that there is the need to show that everyone has dignity and feelings. Darlene quote: ...mostly about how far God was willing to go to show me I had worth. That was the most amazing part of the whole experence! Beautiful, that touches the heart, that does. And we all have worth and I can't much tolerate anything that gets in the way of that truth. I adore your sense of humor too. When I think of the scene in WEGG when Bonnie expresses her thoughts to Gilbert about where she and the family are in life, one, I can relate and two, I am reminded of the scene in Tennessee William's play, 'Night of The Iguana' when Hannah comments on her situation which is unconventional and prone to judgement, she says with such dignity, "It just happens to be what has happened to us."